Additional Info: Damage to cover, some edge damage. Holiday, January, 1953. Multi. Cardstock; paper. 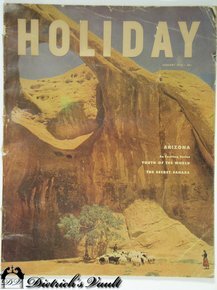 Arizona, United Nations, Panama, Sahara, Movies, Capri, Johannesburg, Ads including Andrea Doria..